The social network launched the feature for its Messenger app earlier this year. 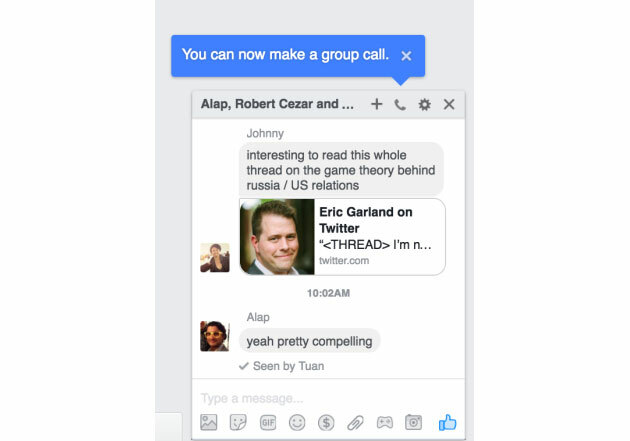 It looks like Facebook is considering the possibility of making group voice calling available on desktop. According to TechCrunch, the social network has given a small number of users access to the feature to test it out -- if you want to know if you've been chosen, open one of your group chats and look for a phone icon near the top right of the messaging box. You only need to click that icon if you want to invite your friends to a multi-person call. Facebook officially launched the feature for its Messenger apps back in April, but making it available on computers will make it less likely to leave out some friends in your group convos. While there's Skype and other apps with the feature, it will be easier to coordinate large calls with family and friends on a platform a lot of people already use. Since this is just an experimental feature, we can't say if you'll be able to organize 50-person call parties like you can on Messenger, or if it'll ever make its way to your account.